This is an updated version of my Recent Posts Gadget.As the name suggests, this Gadget will help you to display the most Recent Posts on your Blog’s Sidebar. The Gadget has an options panel and can be configured to meet your needs. The Gadget inherits styles from your Blog. But you can override the colors if you want(this was done to support third party templates which doesn’t have the skin variables properly defined). External Blogger URL – You need to fill out this field only if you are trying to pull posts from another blogger blog. Snippet Thumbnail – When you upload photos from your PC to blogger using the Blogger Post Editor, Blogger generates a Media Thumbnail of size 72 X 72 px. If you add external images to your blog posts, then Media Thumbnails will be generated. If media thumbnails are not present, the post will be scanned for images or YouTube videos. You can specify which images to use by using this option. The No Image Thumb is a default image which will be used if post has no images or videos(you can turn this off) . Link Color and Text Color – By default, the link and text colors will be inherited from the blog. But if you want to override this, then you can specify the color in any of the two formats. Note : - Those who are using the older version of this gadget, please remove it and add the new one. Your Suggestions and feedback are always welcome. wow great amazing recent post. I like the costumized with the thumbnail. btw if I want to edit the css..? how come? If you followed my Method 1,you cant edit the CSS.. I hope more of you will love this widget..
Great, Blogger has come up with widgets such as this one. :) They've been improving in terms of template/layout. Thanks for sharing the code. I'd try it out some time. @sikumb@ng yes you can do that for now.. But i will probably remove the Blog url option and will use the current blog's url by default..
Great Brother. Always shocking me with your article :) I'll try it. @Another Blogger thanks a lot bro..
perhaps a modified version needed. PS: I won't install new versions of IE as they are buggy and bulky and hardly ever use it. But still i will move the gadget to google code servers..So there won't be any downtime problems..
Actually i am already doing a mod for the gadget.I have removed the blogurl input and will fetch your url automatically..So may be some bugs would be fixed in the next update. How do I change the title text color? @jmw if you want to modify,install the widget using method 2 and modify the css to adjust the colors.. If you are using a highly modded template the colors may not go well using method 1.. If no image is present,the default image saying no thumbnail available will be shown..
this is awesome stuff your template looks sizzling..
i am still modding it.. :) not complete.. I tried using it but thmbnails didn't not appear..
nice widget but thumbnails won't show up on my page???? @Alexiel the images are taken from your feeds..(media thumbnails).. the feed will have media thumbnails only if you add images via blogger..If you use posts which reference external images(like tinypic or the likes),then they wont show up as media thumbnails in the feed and hence wont appear in the widget.. Whenever you add an image via blogger for a post,blogger will attach a small thumbnail version of that image to that post feed entry(wont be visible to you..its hidden in the feed. ).This gadget utilizes that small image.. So if you don't use blogger upload,you cant have a thumbnail..
Great post. Any idea on how to implement this code for Blogger classic template ? i will try to know about it and let you know if i find any info..
how about if we only want the thumbnails to show but WITHOUT any titles or descriptions. I tried to do that from a couple of tutorials i found online, but I filed miserably :/ any suggestions? just in case, lol :) but thanks again! but yea i can help you around,Just use this contact form and leave me your email there..
Can you help me ? Thanks by advance ! i don't understand about "replace your blog feed with your label feed"
Don't change any of the settings in the Widget installer and add it..
Now i think you can figure out what should be done..
blogger feed urls are case sensitive!! Thank you Aneesh. Now i know where is my mistake. You're the great support master of blogging i ever found. I wait for your new improvement. is there anything widget that can be used for slideshow recent post based on category? i plan to built a newspaper blog and every time i look at another newspaper website we can see a headline of that day and showing by slide show. sorry i don't have any widget that does that..
wayanx, that is a good idea. I've been searching for featured content slideshow that is automatically updated..
Aneesh, how can I put a limit on the characters in the title of the post? Do I have to edit the .js file? yes you will have to. Aneesh,you are amazing. will we get to see a recent comments gadget from you with similar features.? and may be a top commentator widget with thumbnail pic of the top commentator? i didn't understand what you are trying to say! See my second comment, disregard the first one as I got it done after reading through comments. Here is the pics I got. I saw arrow that make the widgets ugly. How can i remove arrow and align the left side as it is in the method 1? it is there in your template..
Is there a way that you can add this to a home page of a website that then when clicking on the link will take you to the article page. The recent posts will be updated every time the blog is updated. I do like your other widgets and I will be using them shortly. Now that widget willl be displayed on all pages of www.danielbianchini.co.uk To display it on home page only, search this blog for selective display and you will find what you need.. Here i assumed that your main domain also has a blogger blog..
hi, this is the first time i visit here, your blog is very interesting. i really like it. Very easy to install, I used the Blogger gadget search. Then changed html to add more padding to the right side of the thumbnail. Thanks. I have tried this widget every time I have created a new page - and it never works : the only images it displays are just black boxes . I had seen that Amanda on Blogger had also experienced the same thing . Why is that ? thumbnail isn't automatically grabbed... any fixes? Great widget, but when I install in and then click on one of the recent posts, it goes to the page but all the Google Adsense ads do not display? I have to refresh to see them...any idea why this happens (www.savingtoinvest.com is my blog). I would love to use this widget (and will give you credit for it), but because of the adsense issue makes it hard for me to use. i met the same problem as Andy. it happened when i implemented both this recent posts w/ thumbnails, and recent posts by Blogger Buster. nothing happened when i set up these gadget tho, as i click any entry link on these gadgets, all of the Adsense Ads, except custom search ads, on the page have gone! This problem happened only thru these gadgets. yea both you and Andy where right. But i don't think that either Amanda or me will be able to fix this. Actually that script can in no way affect adsense ads.. These gadgets work like iframes which means they will act as some small external pages which are iframed into our blogger blog. When someone clicks on a link in the gadget,the actual referrer is an external html page(something hosted on blogger with some peculiar complicated urls).. I think that adsense bots are not serving ads when referred from such pages.. I will report the same to some people in the blogger team.. Thanks very much for this great widget. I have a similar question to Petr Buben (August 4). I currently have the last 5 recent posts showing on my blog with the most recent post at the top, but this is a bit redundant, as the most recent post is already at the top of my blog. Ideally, what I would like to show are the last 5 recent posts AFTER the one showing at the top of the blog. Example: if I have posted on 1 June, 2 June, 3 June, 4 June, 5 June and 6 June, the gadget currently shows the posts for 2-6 June, but I would like it to show 1-5 June. Hopefully, that makes sense. Is it possible to easily edit the HTML to make that change? why the thumbnail is blank no image available ? i can't fix it. (this happens to all iframed blogger gadgets)..
Only the Blogger + Adsense team can solve this. I have asked the blogger people to look into it. BTW,you have another easy solution for this.. Use the widget method(Method 2) and there wont be any problems with adsense..
OR are you trying to tell that the latest post doesn't appear in the gadget.? 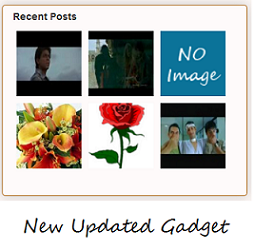 This might be due to blogger cacheing which takes it some time to update the gadget content. if the particular recent post doesn't have an image in that post,then it will display a no image thumnail.. Recent Posts widget blogger is great. But I'm facing some problem. Some of my blogs are not showing up in the widget. The widget is blank. I don't know why this is happening. i don't see the widget on both of those blogs.. :( i can help you out if you have added it to the blogs and it isn't working.. In other words, not show a link to the post of June 6, as that is already easily viewable at the top of the page, but show the next 5 most recent posts. Hopefully, that now makes sense. Great, thank you. That works. i Really like this..can you please modife it to show videotumbnails?? Please i need video thumbnails!! This is one of the most necessary widget that I was looking for. Thank you very much for coming up with this widget. I've also used the featured plug-in of this widget in blogger. But it's bit buggy. some of my blogs are not showing up. This code version is simply working great. I've a small suggestion for this widget. Please include the option to open the links in current page or in a new window. That will be great. hi ..thanks for the widget. i installed first the one in blogger, but i have the same problems of everyone: cant custimse css and adsense non displayed. But i had to change the widget to yours, but now i have the problem of the list style, and thumbnails. Do you think theres a solution for the thumbnails?? i mean, there must cus with other one it works. And how can I disable the link list, without deleting the css of the sidebar ul il. Please let me now anything i can do!!!! its showing no Image available.. I think it shows the thumbnail only if we don't add html tag for the images..
is there any way to show up thumbnails for embedded images (HTML tagged)? are feeds enabled on your blog..?Can i see your blog where it fails to work..? I have used this blogger widget through the normal Blogger template (Add a Gadget), but the URL of each post is BLACK in the widget - I want to change the URL to a lighter color to match my template colors. How can I do that? if you install it using method 2, you can customize it.. by default it will use the sidebar link color. I just wonder if I could use this widget for specific label instead to the whole post inside my blog? Hi, today i found that it is completely not working if i embedde a Youtoube video in a post first. The complete content of the widget is missing. At the moment i put a picture first as a workaround... but maybe someone can fix it or five a hint. Hi. This was such a help. Thank you. My "Recent Posts" looks better with marginalization now. Although... I don't think the ordinary bloke without the slightest idea of CSS editing would really be able to customize it to his liking. Such as the font type, color, margins, etc. I'm not an HTML expert, but I remember some things in computer class which got me through the rest of the process. LOL. Anyway, I hope everyone gets it too. Question: I can only get my widget to display 25 posts. Is that the maximum? Right now it is set for 9 posts, at 528 px, but when it features, it only features the last post. Often it does not feature at all, just leaving a big gap in the column; with the Internet Explorer, cannot find this page. Also, it only works if you come to the blog, from the original blog url. As soon as you click to go to a particular story, or anyone who visits the blog, from a search engine, and lands on a particular post, cannot see the widget, they also get the 'internet explorer' sign. which blog did you try it on? can i see a demo of what you are talking off..
and have you enabled feeds on your blog? Both version are up there right now. I will leave them there fore a bit, but of course if i can fixt htem, i need to remove them. widget version one shows, soemtimes, but instead of 9 posts that it is set to, it only shows two, but it shows them nicely. Widget version two, only shows like my previous comment says. As far as i know my feed is enabled, cause the feed works for followers et al; unless you mean some specific action, beyond that. yea it shows the first two posts only.. and you are using the summary feeds.. i hadn't looked into it yet.. will let you know if i fix it. Yeah, i don't know why it is only showing first two posts, cause for the past few months I have had it, and it showed all nine posts, when it showed (as i said sometimes it did not). But when it does, it is a really nice gadget! Anyway, I will leave up the one with two posts, better than nothing, and maybe it fixes itself, or i wait for you to let me know. can i have recent post widget for one label and only list of 20 post title? if you can modify your widget for my requirement then please mail me. the solution is already mentioned in my previous comments..
Hi, I've implement your great widget using "method 2". Now my question is this: as you can see on my blog - avgossip.blogspot.com - on the right column, I can't manage to have the post titles look right (I would like them aligned and without this "step" effect) and without bold font. Could you help me or explain me where I have to modify your js file? Nice job, it is very useful! Is there any way to use only width parameter on img.recent_thumb stylesheet. This because the images would show better by specify only width, instead of width+height. Is there any options where i can specify the BLOG URL while listing Recent Posts ? Suppose if i have two blogs. A, B. In A, i want to list 5 recent blogs in B ? @TATTOO its working fine here at my end . are you using firefox and are you using some adblocking addon or something like that? and can't u see the demo widget here withing the post which lists my recent posts? Great plugin. I just needed one info. Does this plugin use RSS feeds? If so, can I change the RSS feed URL? Got the answer. Nevermind! How do I add a 'Next' Button to his widget. but when you refresh the page to appear adsense advertising? there are still errors. i don't know what happened on my site, help pls. hello..im newbie in blogging and i loves your widget but recently i've change my layout and seems the color of the widget doesn't fits and hardly be read..i don't want to change my css font color and so i try to edit the widget coding by doing expand widget templates but i stuck seems i'm not pro in coding.can you helps me sir?? Are you aware that your wonderful gadget has stopped working for many people? Such a pity that you gadget seems to have stopped working; I have had to remove it from my blog - any idea what the problem is and can it be rectified? I m using this widget and my adsense ads are being blocked when i open any link through this. Thanks for your nice post! I like it. And I enjoy here. Great job Aneesh. I am having troubles in making thumbs apprear on the left and titles on the right, though. I tried modifying xml file and even js linked inside the xml file... without appreciable results. Could you give me suggestions or prepare a version like that (more usual with thumbs on the left, i think)? Hi Aneesh, it has been nice reading all your tutes and heads up to all your efforts. I have been searching on various places on how can i show only post pics in blogger homepage. Can i customize template to be as such. It should look like something as http://btemplates.com/. I need your help on this or else even a pointer where i can do this on my own will be appreciated. nice idea to also put it in a post so we can copy the code to do same! seems some other do use your code and ad a "promo" link to their web, when you do it for free with no ad! It's possible to make this with posts with videos, not with images? Awesome gadget, Aneesh! Just stumbled on it a couple of days ago while doing an article on adding gadgets in blogger, installed it immediately and am so delighted with the result! Thanks a bunch! @Nuria Cortés - would try to add that feature when i get time. I wish there were an option to have thumbnails only and make the thumbnails links to the posts. And also to make the thumbnails a little bigger. Anyone know of a way to make it do all that? But it's a cool gadget anyway. gread gadget.. thx 4 u. My recent post widget thumbnail photos look very blurry as I adjusted the size code to 151px from 55px. How can keep the size at 151 but make the pictures look super clear. Thanks for the gr8 widget. I was about to try the other widget from other blogger (not degrading his efforts and hard work) but this one seems to suit my blog. I've finally found a recent post widget that I can get to look how I want (thanks to the css access in method 2), but two things; how do I stop the post summary from being in italics, and how do I resize the date, comment-count and 'more' font? great widget. but i found a problem with the widget. when the link in the recent post is clicked the adsense ads are not displaying. @Alex- yes you are right. This is a problem with all gadgets developed using the Gadget API. I had reported it to blogger but no solutions till now. The gadgets are rendered in iframes and when the page is reffered from such iframes adsense ads doesn't show up. this doesn't work with internet explorer. anyway to fix the bug? "this doesn't work with internet explorer. anyway to fix the bug?" This is why I am here as well. Also, this should be made known to bloggers while a fix is in the works so they may choose another method and not lose page views! Few blogs with multiple XML gadgets have problems in rederinng propely on IE. Add the widget using Method 2 and it wont have any problems. This will be automatically fixed.. but will take time for the code to get updated(as it is cached). So if you need a quick fix change the url in the Gadget options. Thank you very much for your quick responce. You are right, today it works properly in Firefox. I think , yesterday, there was something like a loading problem, or any way. I tried both at my computer and from adobe browserlab, yesterday. I couldn't use post summaries because of there is a sentence like "click for foto galllery" at begining of each post. so summaries are not nicely shown. At the other hand, I think there is a limitation as 25 at number of posts to be displayed. I believe that just so beautiful gadget can be useable not only for recent posts, can be useable for "all posts" list. Love this widget. But can you show me what the html looks like for this widget so I can go in and try to change to color and font? I have limited compurter knowledge but have changed other things in the template when I know where the specific code is. Great site, I have used many of your tips on my blog. I would like this widget, but only with a thumbnail. No text or description of title. Is that possible i have seen it on other websites. What can i do? where she has random images but it links to her post page. Do you know how to do that? I'm looking for something like that on Joudie's link too. What I'd like is a set of thumbnails of all the images I have in my blog. Some posts have no photos, some have more than one and some are from my flickr photostream. I just want a collection of images that you can click on and it will take you to the corresponding post. Sorta like your followers section. At this point I don't know if I want random photos or the first few and then you can click next or previous to see more.. if you know what i mean. Hi, Aneesh, love the hack, but I have a question. If a post has no image, is there a way to remove the "No Image" graphic and show only the text? You can see your widget in action on my blog here. Thanks again for all of your super work. We'd all be so bland without you. But how do i change the Post Summary text from Italics to normal? Thank you for the widget, it's great. Can we change the color? My background is black and all the text is hidden. @miss -V - Add the Widget using Method 2 and the color issues will get fixed. Is it possible to make the summary POST non-Italic?? Brilliant widget... really wan't to modify fonts and font colours, could you tell me how? I am a complete new-comer and really appreciate the help. How do I change the color of the widget? Here 's the font color black being the bottom of my blog is black. Then there's to see. is to help me? @Vinícius,ajpmann,Rachel Weisz - add the widget using method 2. 1) The widget does not pick up my font/color settings for the sidebar, so I'm going to have to edit the html to make it work. Not the worst thing in the world, but it would have been nice not to have to do that. So either set the wigdet to use the blogger settings, or have a place where color/font can be set. 2) I love the preview thumbnails, but a lot of my posts do not have photos. I would have rather seen no thumbnail in those cases than a graphic that says "no thumbnail." (It takes up space unnecessarily.) I turned off this feature even though I love it. But thank you. It is really great. 1)add the widget using method 2 and colors will get fixed. I posted before as appreance is "wavy" in IE7 and IE8. You have promised to fix this problem after my post, Will you solve this problem near future? Thanks again for your lovely widget. please help how to change the natural size? Loaded your widget, but am getting only a window with Internet Explorer cannot display...." message. because the text add comment on hover shows underline. I want to ask you if i can make a image link to the post. I mean by clicking the thumbnail image instead of the post title summary. I´m trying to edit the code but i don´t know how to do it. please, i need some help. Thanks! it shows plz close alt with ";"
thank's very much.. for the widget, i like it. is great..
thanks pal! it's a nice cool widget. I'll put it into my blog! Is it possible to get only Thumbnail pictures as link to recent posts without any text around? Wow!!! Cool widget! Works fine in my blog! :3 thanks!!!!! But it's a great idea !